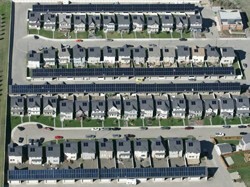 A new Canadian neighborhood is North America’s first solar-powered community. The community, named the Drake Landing Solar Community (DLSC) is located in the town of Okotoks, Alberta, and consists of 52 houses all powered by solar (what else?) energy. They started testing on June 21 last year, the summer solstice. It was a glorious day and the first results were that the stored energy captured was exactly as had been calculated. Now the engineers say that in five years’ time they’ll be able to capture enough summer energy to provide more than 90% of the space heating needs of the homes during the winter months. The houses sold like hot cakes and the last one was occupied in October this year. DLSC’s underground energy storage system is unique in the world. Dubbed the Borehole Thermal Energy Storage (BTES), the unit links all the newly built, single detached homes together. The rest of the building efforts have been as green as possible and the entire community has been awarded gold-certified status under the Built Green Alberta program. That program in turn is modeled on NRCan’s EnerGuide for New Houses Program. All of them have rear garages separated from the houses via a breezeway. The best news is of course the low carbon footprint of the people that occupy the houses. A typical household will generate only 1 to 2 tonnes of greenhouse gas annually, compared to an average Canadian footprint of around 6 to 7 tonnes per home a year, according to a report on YellowsandBlues.com. This is not accurate. The Earthship Communities near Taos, New Mexico were in use long before this and are growing. The houses in the Earthship communities are totally off the grid. They even treat their sewage and clean it before discharge. Thanks for the comment. I’ve heard about the Earthship Communities. Here’s a link for interested readers for more information about the Earthship project.